So I'll admit this project was always on the radar when it came to this season, and I'll admit it's probably better we get it out the way now before we delve deeper. Because there's always one: the indie project that doesn't just bring in a ton of critical acclaim, but becomes a surprise hit and even nets a few fleeting singles on the Hot 100 on the strength and popularity of the artists alone. And what caught me by surprise is that this wasn't two established legends teaming up either, at least not at the time. Yes, full disclosure here, I was familiar with the work of both Mos Def - now known as Yasiin Bey - and Talib Kweli before this, and they both had had some breakout verses before 1998, but I could have sworn they had more established bodies of work before this. But no, while Mos Def had verses with Da Bush Babies and De La Soul and others within the Native Tongues camp, and Talib Kweli had multiple appearances on Doom, the debut project of Cincinnati hip-hop group Mood in 1997 - which hopefully at some point we'll cover here - neither artist had a full-length solo debut ready while they were both signed to Rawkus. In fact, what might be more notable is Soundbombing, an early compilation release from Rawkus that brought the entire roster together and may have given Mos Def and Talib Kweli the connection they needed - that's another project we should probably cover here, come to think of it... Anyway, given that they both postponed individual projects to work together, with Talib bringing his producer friend Hi-Tek and Mos Def looping in Native Tongue affiliates like 88-Keys and Da Beatminerz, that chemistry was too good to squander, so much so that to this day while the duo has teased a return, this is the only project they would complete together: so let's get into the unlikely smash that might not have been the first introduction but absolutely put them on the map. That's right, we're talking about Mos Def & Talib Kweli Are Black Star, and this is Resonators! So I'll be honest, I've had this album on rotation pretty consistently the past few weeks ever since it won the Patreon polls to the surprise of no one, and the most immediate observation also becomes the most exasperating one: yeah, this album is goddamn great, damn near a hip-hop classic that was rightly canonized at the time and has held up remarkably well to this day. Hell, it's almost so straightforward and effective that you wonder why certain outlets didn't give it critical acclaim in the day... but that might as well set the table for what Black Star was in 1998: a response. Indeed, more than the distinctly underground styles that took sweeping potshots at the mainstream that you'd get from peers on Rawkus like Company Flow, it's hard to ignore how much Black Star is framed as a direct and accessible retort to the era of empty flash that Puff was pushing in, deeply entrenched in black, New York-focused hip-hop culture. And that's a tricky line to walk: the line being pushed by the industry establishment was that lyricism, boom bap and conscious content was out, so for Mos Def and Talib Kweli to deliver a project that respected hip-hop traditions while sounding polished, forward-thinking and deliberately avoiding sounding like a throwback would be a tough sell. Now granted, if you look at the Native Tongues acts it's not like that tradition had gone away, but the gangsta rap era had sidelined much of that sound, especially in the mainstream and there was a question how that sound would persist. And yet Mos Def and Talib Kweli found success reinforcing the conscious tradition that did reignite in the late 90s adjacent to the mainstream... mostly by just making a kickass hip-hop album that is layered and intelligent, but not impenetrable. Indeed, the fact that Black Star is so tuneful while relying on stripped-back beats, spare melodies, sinuous basslines and a genuine organic tone probably did most of the job before factoring in the phenomenal chemistry in bars and melodies between Talib and Mos Def. What's interesting is that while there are samples and scratching, it doesn't lend the project a dusty or weathered tone that had come to represent the old-school boom-bap New York sound - even today it sounds contemporary as a project that could be released, because even with songs shouting out b-boys and graf artists and how 'Children's Story' interpolates Slick Rick, they're more old-school callbacks rather than feeling ossified in the past. And yet that New York feel is unmistakable - beyond the punchy boom bap, scratching and samples that pepper the project as introductions and interludes - and the Spanish phrases opening 'Respiration' - there's still a warmth and crackle to the mix that feels burnished even off some of the dark and warped minor tones that creep across 'Re: Definition', 'Hater Players', and 'Twice Inna Lifetime'. And even then there's a balance of tone: the tension coursing through the bass off the questioning guitar phrases on 'Astronomy (8th Light)' and 'Respiration', the warm sensuality of the grooves of 'Brown Skin Lady' and 'K.O.S. (Determination)' to the weary contemplation of 'Thieves In The Night'. Even 'Children's Story', where Mos Def might sound a bit out of pocket with the old school flow I still hold as a part of the album I really like, just to add a brighter, less mature moment that is such a De La Soul move and all the more appreciated for it. But that's just great production: as much as it plays in contrast to what was being pushed in '98, what might stand all the more starkly is the lyricism and content. And again, what's telling is how while this subject matter was common on Native Tongues projects and that Talib and Mos Def weren't really reinventing the wheel - especially in the underground, where it's not like these subjects had gone away - the more accessible framing was intended purposefully for a larger audience - Company Flow didn't care to engage with a wider demographic outside of the rap nerds, Black Star did. And what's telling is that while there's obviously ego on display, it's never at the expense of the audience or the other MC - you could make the argument that their content and flows are so evenly matched here that you could have active debates who dominated each track - with the big exception, of course, being 'Respiration' with Common, where even if I think both are close Common's more gritty and emotive framing of Chicago feels more earthy and heartfelt. And I really dig the framing of how they presented their progressive thinking and politics: aspirational, but grounded and realistic of what would need to change and evolve - they weren't about to mince words in describing real hardships, physical, mental, and emotional, but the framing wasn't really nihilistic or crushing either - there were deaths and tragedies, but there was a chance to make this right, both within hip-hop culture and for the black community at large. Take one of the most immediately recognizable tunes on the project, 'Brown Skin Lady', which right from the start juxtaposes the sample of the 1989 film Chameleon Street - a satire film set in Detroit with this monologue showing societal conditioning reinforcing colorism - with the rebuttal of the Gil-Scott Heron sample from the song 'We Almost Lost Detroit', with Mos Def and Talib delivering verses that are so joyous in their appreciation of dark-skinned women, which amazingly manages to skirt past any depreciation of other standards of beauty, something not even Kendrick pulled off! Granted, this is the late 90s, and while questions of respectability politics were starting to take shape among parts of black academia, it's hard to ignore there still being seeds of that similar moralism on songs like 'K.O.S. (Determination)', where hustling is framed as spiritual emptiness and lacking self-determination to get out of the trap. But I reckon that neither MC was intending it like this, as both seem to have a lot of broad and specific skepticism of the system at large, likely speaking more to self-loathing and greed that perpetuates the easy buck while slamming both the industry and corrupt systems at large. And while 'Children's Story' is the easiest parable to grasp about selling out on the project - along with a couple easy shots taken at Puff's dilution of the culture both in strip-mining the past and his manipulation of the industry that doesn't reflect the reality of the streets - the two I liked the most were the interlude 'Yo Yeah', which ends with a sample from poet Norman Jordan showing black people talking about the flaws of their brothers while pointlessly adhering to a broken system, and 'Thieves In The Night', where Talib openly questions a capitalistic structure in which black empowerment is defined and shaped by white systems at the expense of self-worth. And Mos Def goes further, highlighting how there's no room for gradation within black culture to allow humanity to thrive, and even then he questions how much of even his message is lived or just sincere for the stage, when they don't even own the masters behind them. It's thought-provoking stuff, so much so that I've always questioned why the album ends with the posse cut 'Twice Inna Lifetime' which can't quite have the same impact, especially when a healthy cross-section of the album is full of the same intricate wordplay and assertions of skill. But while we're in this territory... look, as much as I appreciate the viciousness of 'Hater Players' and how 'Definition' is a striking single in its own right, it's hard to ignore its dark mirror 'Re: Definition' and Mos Def dropping homophobic slurs, which might be reflective of the time, but sure as hell doesn't help any air of conscious enlightenment, especially when Mos Def has expressed these views off-record later on - not helped by how Punchline says he's going to start a 'gay rumor' about his adversary on 'Twice Inna Lifetime'. And I do have a few other issues too: a few tracks especially near the back of the album can drag a bit, and I do think the sequencing could have helped refine this a tad, but those are minor quibbles overall. But really, if I'm looking for a hip-hop album that deserves the vast majority of the critical acclaim it received at the time and for the most part holds up today, I'd go to Black Star, launching the careers of conscious hip-hop stars even cresting amidst the mainstream and putting Rawkus on the map. 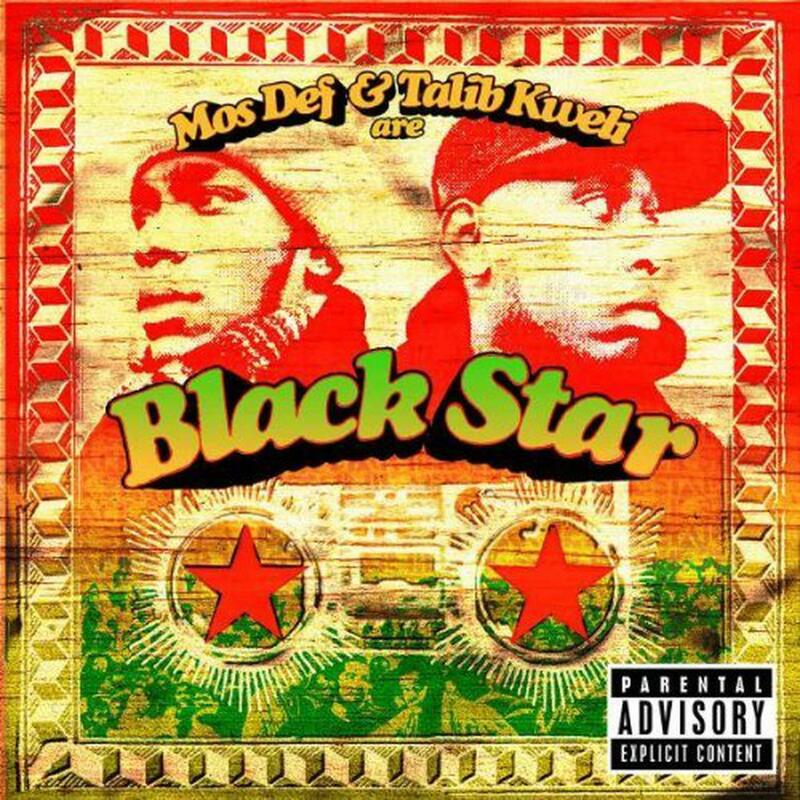 And while there were certain publications dismissive of the sound at the time - The Source unsurprisingly springs to mind - Mos Def & Talib Kweli Are Black Star is a truly excellent album and stands the test of time, netting a 9/10 from me and the highest of recommendations. Folks, if you're looking for a gateway into the late 90s underground while remaining accessible and tuneful, there are few better than this, so absolutely make the time to check this out.